Howdy, folks! We’re at the Scott’s Addition location chatting with Community Manager EmmaLee Gough. It’s the week after Thanksgiving and all of our Coworkers are falling back into their daily routine of killer productivity. It can be difficult to steer a ship of such size as our Scott’s Addition location, and we’re hoping to gain some insight from EmmaLee here as to just how she does it. Ok, right out the gate… you’ve worked plenty of other places and we gotta know: What is your favorite thing about working at Gather? Gather is full of cool, interesting people doing a variety of things that make Richmond run so well. I love the assortment of members and businesses here. I also really like the community aspect of Gather, everyone’s working together- plus there’s always extra food in the kitchen. There is no easy, one answer to this next question, but what do you think is one of the secrets to helping manage a coworking space and keeping everybody in high spirits and high productivity? Being a Community Manager, is literally that: managing a Community — making introductions and then seeing coworkers who didn’t know each other beforehand create a mutual friendship or even collaborate business-wise. I have found that the secret to a productive workplace is to make work a place you look forward to coming to. The average American is going to spend 40-50 hours of their time at the office — so I feel one of my responsibilities is to create a warm, friendly, and overall fun environment. Even something as simple as Fruit Water or our weekly Cookie Hours from Sugar & Twine can brighten someone’s day — and help get you through the work week. Now…. we have our Gather Downtown location, we have our Short Pump location, and we have where we are now/where you spend most of your time: our Scott’s Addition location. You know this place better than most anyone else… what is one way in which you think our Scott’s Addition location stands out from the rest? We often get compliments on how cozy it feels here compared to other coworking or traditional office spaces. My favorite spot is the downstairs area, it’s very communal, there’s always some conversation going on, and coffee in the air. I would definitely say that the members here help to make it what is is. Overall I feel like it’s the best representation of the city of Richmond because it is so unique yet authentic. As somebody who works out of this space quite frequently, this writer is strongly inclined to agree with your Scott’s Addition sentiments. Next q: It’s 12 o’clock and you are literally figuratively starving, and you forgot to pack a lunch. Where do you go to get some grub? I would go to Lemon Indian Cuisine, they have the best lunch special. It’s vegetarian-friendly. You can get soup, salad, entree, and surprise side dish all for ten dollars! And, it’s within walking distance. I also have to give a shoutout to PERCH- It’s literally next door- which just opened yesterday officially for Lunch. The vegan crab cake sandwich is sooo good. Scott’s Addition is the perfect neighborhood if you’re a foodie like me. 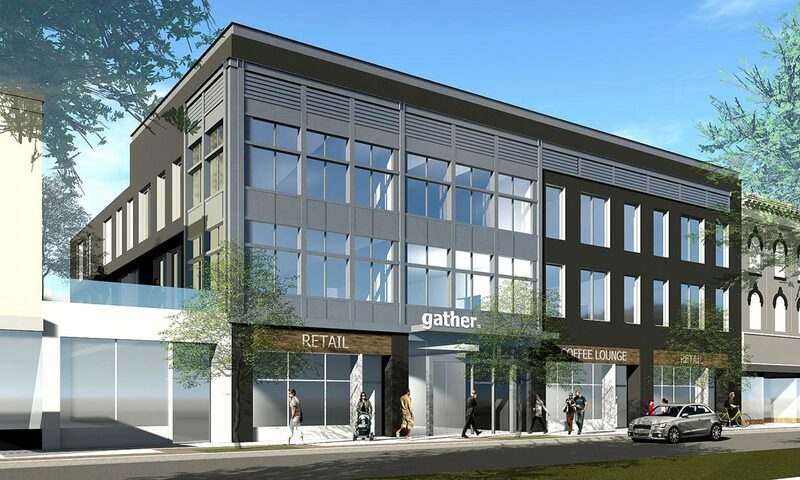 Ok, now I’d like for you to go with your gut on this one — what is the first thing that comes to mind when asked to describe a really good time you’ve had at Gather Scott’s Addition? I really love all of our community events. End of the month happy hours are always a good time. It’s a chance to really get to hang out and talk to everyone after work. It was so awesome the amount of people that participated in the Halloween happy hour. Two Coworkers dressed up as me and [fellow Community Manager] Caren! I also loved our Snacksgiving earlier this month, it was great getting to try everyone’s signature dishes. I still am thinking about that baked fennel Emily Jaquiery brought! Ohhh, that baked fennel! We’re still drooling. This next one is highly hypothetical, but maybe also this is something good to consider for the future. Let’s pretend that uou as our Community Manager are tasked with starting a band featuring some of our Scott’s Addition Coworkers and employees. You’re the lead singer! Who else would you ask to join the band? Mac, because I hear he plays guitar. Ryan Holloway is a good baritone & hype man. Caren would be my tambourine or triangle player. I would also have Marle Hylton, because she’s a singer and actually auditioned for American Idol once! Our band name would be called: The Office Nomads. Whooa, let me know when we can catch y’all’s first show! Last but not least, and this is a fun one as well: If you were working here as a Coworker, what kind of field do you think you’d be working in and why? I could see myself doing the Social Media and Blog Posts for Gather- so you better watch out! Seriously I love working with people and I love to travel. It’d be great to be able to work for a travel site. Something that would encourage people that the world doesn’t have to be such a scary or intimidating place, and travelling doesn’t have to be expensive. Ha! This writer will watch out, for sure. Wait! One more bonus question: How was your thanksgiving? It was really good. I went to DC, got to see a bunch of my friends, and check out some of the museums. Best part of DC is the food, I got to go to my favorite Cambodian restaurant. Awesome! Thank you so much for joining us EmmaLee, and thank you for keeping this community vibrant and the productivity at an all-time high!